Line six muffin holes with foil muffin liners. In a blender, combine wafers, extract, cocoa, fat-free whipped topping and milk; blend until completely combined. Divide mixture among prepared muffin liners; freeze for 2 hours or more. Just before serving, top each with 1/6 of mint patties, 1 teaspoon of chocolate syrup and a tablespoon of whipped topping. Yields 1 mint dessert per serving. 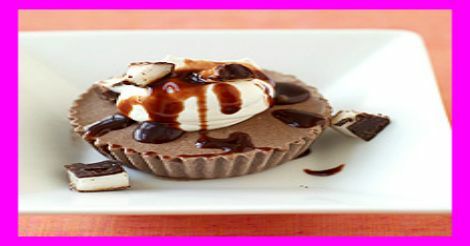 This easy chocolate dessert can be made in several flavours. For a pure chocolate treat, replace the mint extract with chocolate or vanilla extract and swap the peppermint patty for an ounce of mini chocolate chips.